A problem that all the historic residential schools experienced was the scarcity of “tangible apparatus” or educational models and equipment. In their report to the state of Kentucky in 1871, the Board of the Kentucky School for the Blind (KSB) described some of the types of models they would like to purchase if the state would increase their appropriation. Apparently the state of New York had bought an expensive set of mathematical models overseas. The KSB Board had located another potential supplier: the mechanical department at Cornell University in Ithaca, New York had a new woodworking shop that was turning out a cheaper set. 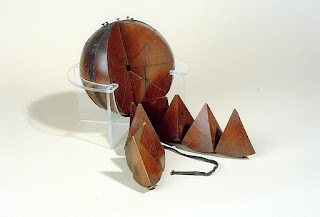 Our object this week is a segmented model of a sphere which might have come from that set, but definitely came from KSB. The sphere will divide into eight “slices,” much like an orange, and each “slice” will further divide into four wedges, so that the entire sphere is composed of thirty-two pieces. The wedges in each slice are held together by strips of leather. Pins on the tops and bottom of the slices allow the entire sphere to be held together by ribbon ties. Early tactile models such as these would have been precious commodities, an indicator of the “modern” education provided to an institution’s students.